Are your ancestors famous historical figures? History Search will compare your direct ancestors (and their siblings) to projects on Geni that focus on historical or famous individuals. It will list any matches found, the relation, and what projects they belong to. It can also search for master profiles, problem profiles, pending merges, and can create a simple visualization of tree completeness. Note that not being connected to the world family tree will severely limit the potential for ancestor matches. 10 generation graphs to focus your research! 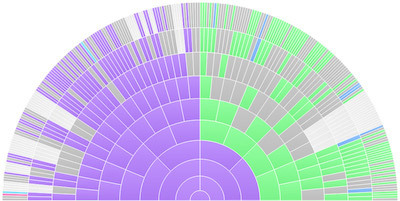 Ancestor Graph can build a 10 generation interactive graph to help you identify areas to focus your research. It is based on the excellent desktop visualization tool iSeeTrees. Along with easily showing you the gaps in your tree, it will identify duplicate ancestors (pedigree collapse) via color. In addition, it provides options for viewing the status of the profiles (Claimed Profile, Private Profile, Public Profile, Master Profile, Problem Profile), Gender, and Location (Country of Birth, State/Region of Birth, Country of Death, State/Region of Death). You can see information as you hover over the profiles to include name, dates and location. You can zoom in on any ancestor or open the profile in a new tab. Save the graph as a image or a Adobe PDF! Disclaimer: HistoryLink uses the Geni API but is not endorsed, operated, or sponsored by Geni, Inc.